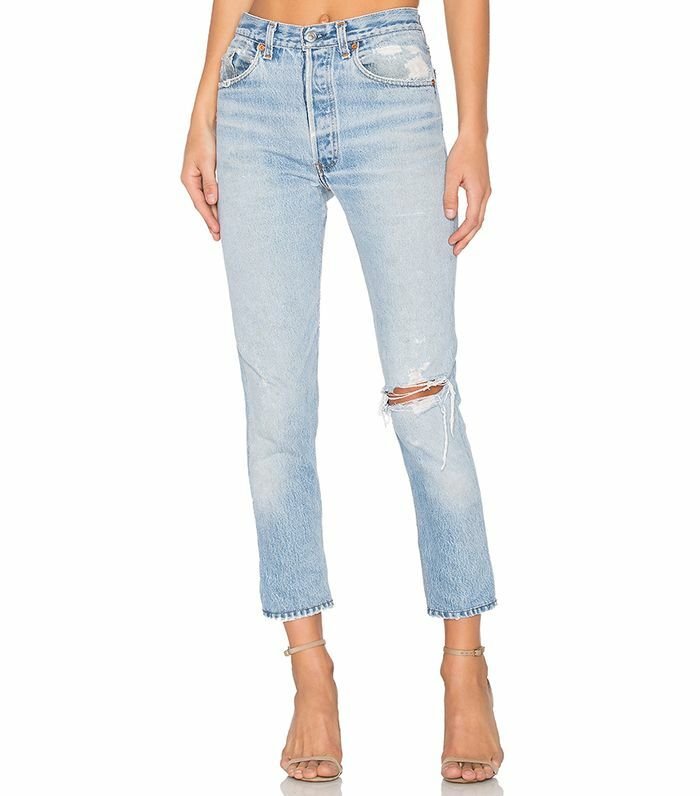 Every fashion girl we know is perpetually on the hunt for the perfect pair of vintage jeans. They have a broken-in feel and are worn in all the right places. But finding them can be a challenge. It requires frequent visits to vintage stores and flea markets to uncover a pair that has a wash in the right shade that fits just right. If you’re looking for an alternative, you might want to try distressing the jeans in your closet instead. To find out the best way to achieve the look of authentic distressing, we tapped Sean Barron, the co-founder and CEO of Re/Done. The brand is known for its reworked Levi’s and line of jeans that resemble vintage denim so closely, it’s sometimes hard to tell what’s the real thing. Ahead, Barron is sharing how you can distress your jeans with nothing more than sandpaper and a washing machine. Want to find out how simple it is? Keep reading to find out how to distress jeans in four easy steps. Rub it on the spot you want distressed. Once the fibers start to break, use your hands to tear the hole to your desired size. Wash your jean to create an organic-looking fray. Wear a pair of reconstructed denim with a chic blouse and heels for dinner. Style your distressed denim with a floral top and platform sandals. An unfinished hem is a popular style this summer. Show off the distressed style with a basic top. Well-fitted skinny jeans are a necessity for your closet. Tuck a band tee into your distressed denim to achieve a vintage-inspired look. Update your overworn white denim with a distressed pair. Style dark-wash jeans with black sandals for summer and black boots in fall and winter. Light-wash denim can be styled for any season. Without a doubt, high-waisted denim is extremely flattering. Break out your white sneakers with your distressed jeans. The undeniable It denim for the summer. When adding distress to your denim, the knees are an easy spot. Asymmetrical distressing adds a diverse flair. Don't want to expose your skin? Add patches underneath the holes in your denim. A high-low hem effortlessly elongates your legs. French girls style their light-wash high-waisted denim with statement blouses. If you're on the more petite side, cropped denim will guarantee a fitting inseam. To avoid mistakes, try on your jeans and mark exactly where you want your distressed accents. Next, find out why this editor only wears under $100 jeans.